Google's Android 4.4 Kitkat mobile operating system had introduced with Nexus 5 and it was a first device running a latest Android version and now Android 4.4 Kitkat OTA (over-the-air) update is rolling out for most of the compatible android based Smartphones and Tablets such as Nexus 10, Nexus 7, Nexus 5, Nexus 4, Samsung Galaxy S4 Google Play Edition, HTC One Google Play Edition etc. But still there are many Android devices left which seems to be in a waiting list to get latest updates such as Moto X, LG G2, Samsung’s Galaxy S4 and Xperia Z1 etc. Currently Google has officially provided Android 4.4 Kitkat Factory OS Images Original Firmware for Nexus 10, Nexus 7, Nexus 5 and Nexus 4 which are "Nexus" based Android devices from various smartphone and tablet manufacturers but soon Factory OS Images Original Firmwares of Android 4.4 Kitkat will also be publicly available to general users for other devices as well from Google's site. 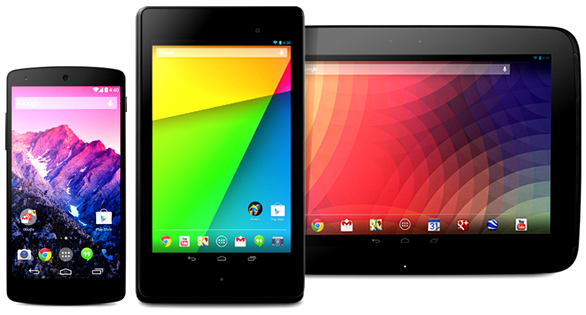 So if you own any above mentioned Nexus device than you can Manually Download and Install Android 4.4 Factory Original Firmware Images Officially for Nexus 10, Nexus 7, Nexus 5 and Nexus 4 via Direct Links available below. You can download and install following original factory firmwares to restore your nexus devices to its original state.